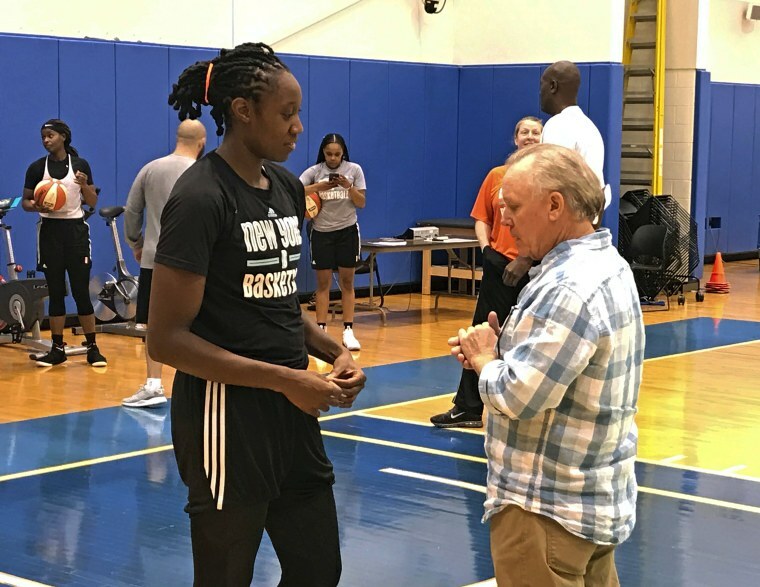 NEW YORK — It’s the one of the final practices before the WNBA’s New York Liberty head to the playoffs, and the team’s center, Tina Charles, is focused on her drills. She effortlessly drops free throws into the basket, before pivoting to work on her handling. She laughs with her teammates as they toss up wild half-court shots, and listens attentively as her coach gives detailed instructions. She's focused. So focused, in fact, that she didn’t notice her mom sneak in to the Madison Square Garden training center along with a small group of visitors until someone tapped her on the shoulder. The gym fell silent as Charles’ mother introduced her to a man named Dan Carlson — a man who is alive today, thanks to Charles’ lifesaving work off the court. In 2013, Charles began donating portions of her WNBA salary to funding Hopey’s Heart Foundation, a charity she started that is dedicated to curbing deaths in the United States from sudden cardiac arrest. The organization works to ensure schools and public places have life-saving equipment like defibrillators on hand. One such defibrillator saved Carlson's life. According to the American Heart Association, heart disease remains the leading cause of death in the United States and more than 400,000 Americans experience cardiac arrest outside of hospitals each year. What’s more, countless lives could be saved if the right equipment was available — such as automated external defibrillators (AED). Charles said she didn’t realize how common and deadly sudden cardiac arrest could be until she read about Wes Leonard, a high school basketball player who suffered a heart attack and died after basketball practice in 2011. And when her aunt died a few years later from organ failure, Charles committed herself to conquering the problem with the same passion she brings to each New York Liberty game. “I said, ‘You know what, I want to mirror the image that my aunt meant to me — I want to be a servant to others,'” recalled Charles, who started donating the entirety of her WNBA salary to the cause in 2015. Her foundation, named Hopey’s Heart in honor of her aunt, provides grants for schools and recreation centers to purchase AED equipment and for employees to be trained in how to use it. Carlson works as a landscaper at Marbridge Foundation, a facility for adults with intellectual disabilities that received a Hopey’s Heart grant. Charles said she admired the foundation because of their determination to “keep their heart’s community safe.” And it was that determination ultimately saved Carlson’s life. Although he doesn’t remember the day he had the heart attack, or even the days afterward, Carlson told Charles how she helped save his life. “From what I understand, I was sitting on a bench outside of the gym at Marbridge,” he said, adding that a co-worker was finishing up a bocce ball class nearby when she heard him fall. They both began crying again. Charles leaned over and gave him a hug. She said she knew one of her devices had helped to save a life, and now Carlson is proof — living proof — that helping others should always be a priority.